Pakistan appears to be close in securing its first international customer for the joint Pakistani-Chinese Pakistan Aeronautical Complex/Chengdu Aerospace Corporation (PAC/CAC) JF-17 Thunder multirole combat aircraft, according to media reports. Pakistan and Nigeria have allegedly inked a memorandum of understanding for the purchase of an unknown number of JF-17 multirole fighter jets a senior official from Pakistan’s Defense Export Promotion Organization (DEPO) told IHS Jane’s Defense Weekly during the Africa Aerospace and Defense exhibition, held in the second week of September in South Africa. It is unclear whether this will be the first JF-17 export contract, since Myanmar in 2015 has allegedly placed an order with China for a squadron of JF-17 fighter jets, although this has not been officially confirmed. Throughout 2015 and 2016, Pakistani officials, when questioned by reporters, repeatedly have stated that a contract has been signed with an Asia country without, however, ever naming it. Although the report[of is unconfirmed, it is extremely plausible. To begin with, Myanmar has previously operated or currently operates a number of Chinese-made aircraft including: 48 NAMC A-5C fighters, 52 Chengdu F-7M Airguard fighters and 4 Y-8 medium lift transports. The Southeast Asian nation’s air force also recently purchased Sky 02A Unmanned Aerial Vehicles (UAVs) from China, and built domestic copies of them. Most notably, Myanmar is also believed to operate 4-10 Karakorum-8 (JiaoLian-8) jet assault and trainer planes, which were also jointly produced by China and Pakistan. Some reports indicate that the deal for the K-8s also included a license in-country component. Pakistan produced a total number of 16 JF-17 Thunder aircraft in 2015 and intends to increase production to 24 fighter aircraft in 2016. Pakistan produces 58 percent of the airframe and China 42 percent. 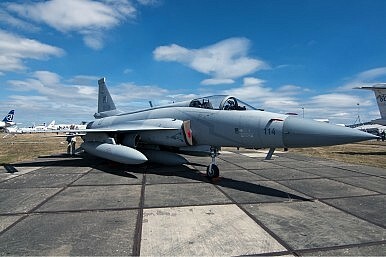 The JF-17 is intended to replace the PAF’s fleet of Dassault Mirage III/5 fighter jets by 2o20. Overall, there are 65 JF-17 aircraft currently in service with the PAF. Islamabad and Abuja are expected to sign a final contract in November of this year. IHS Jane’s Defense Weekly reports that Nigeria’s 2016 federal budget allocated around $25 million for three JF-17 fighters jets and approximately $9 million for ten 10 PAC Super Mushshak trainer aircraft, a PAC licence-built variant of the Saab MFI-17 Supporter aircraft.